Every year since 2010, Samantha Reynolds, an 8th grader at Martin Meylin Middle School in the Lampeter-Strasburg School District, has taken classes at Pennsylvania College of Art & Design, 204 N. Prince Street, Lancaster. 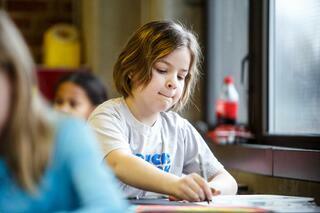 Samantha’s younger sister Callie, a 4th grader at Hans Herr Elementary, also takes classes at PCA&D. Pennsylvania College of Art & Design’s courses for youth include process-oriented studio courses designed by age level and courses that allow children to explore color, watercolors, drawing, cartooning, sculpture, textiles, printmaking and more. The courses are designed with specific age groups in mind and offer a creative outlet with a flexible schedule allowing for morning-only, afternoon-only or full-day enrollment. Through its Continuing Education department, PCA&D’s youth classes teach over 400 kids annually with over half of them attending the summer classes. The college also provides full and partial scholarships to school-aged students based on merit and financial need. These scholarships, which are assigned to deserving students by local art teachers, provide access to art learning for children of Lancaster City & County. 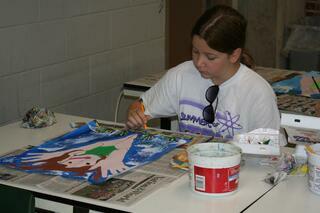 In the last year, PCA&D provided 97 Youth Art scholarships to local students totaling over $11,000 in awards. Courses are also available to high school age students with an emphasis on college preparedness as a way to help teach teenagers specific techniques but also as a way for them to improve their portfolio as they begin seeking admission into art college. High school classes are available in two sessions and meet daily for two weeks. Session 1 meets July 10 – July 21 and class options include Intro to 3-D Computer Animation, Figure Sculpting, and Graphic Design for Social Good. PCA&D also offers Adult Studio classes for personal enrichment such as plein air painting as well as professional development courses such as website design, social media marketing, and photography. Course descriptions and registration for summer classes at PCA&D is available at http://pcad.edu/summer. For more information, please contact (717) 396-7833 x1019.